Depression is a well-known symptom of menopause. Mood swings and low mood can result from this emotional strain, and in some women, they can even progress into clinical depression. It is important to keep tabs on your symptoms and if your depression becomes clinical, seek medical advice immediately. Depending on the extent and degree of the depression, different types of therapy might be required. Keep reading for an insight into some of the therapies available for depression, including lifestyle changes that would be beneficial to all sufferers. Generally speaking, decreasing your stress levels will improve your mood. Therefore, incorporating relaxation techniques into your life can help reduce the effects of menopausal depression. This is due to the physiological responses to the relaxation state - a decrease in blood pressure, pulse, respiration rate, oxygen consumption, and overall metabolism. Below is just one example of a relaxation exercise you could try. Rhythmic breathing. First, slowly breathe in, and then out. Pay attention to your body's natural response. The breaths should be as deep as possible. This simple act of focusing on your body's sensations will help you to relax even more. Exercise releases serotonin and endorphins into the body, which act as natural mood enhancers. This, along with an increase in self-confidence and the potential boost in social life, means that regular exercise can be an effective therapy for menopausal depression. Adults between 19 and 64 years of age should be engaging in at least 20 - 30 minutes of moderate intensity exercise every day, but any exercise is better than none. No matter if you decide to take up cycling, swimming, walking, or even gardening, actively moving is key to a better mood. 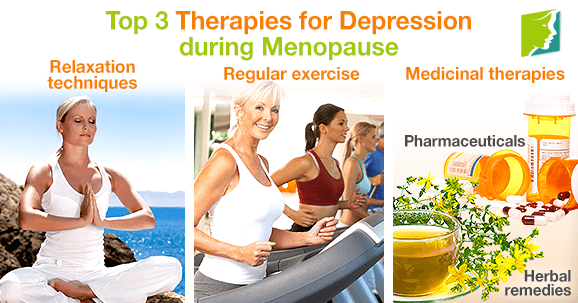 Medicinal therapies for menopausal depression on come in two types: pharmaceutical or herbal. Herbal remedies are ease to find, although care must be taken when deciding which herbs to take, as different herbs have different side effects. Pharmaceuticals can usually be obtained only with a prescription, and the type taken will depend on a medical recommendation. Both types should be treated with caution. Read on for more details about the different types of medication available. This herb has been studied extensively and shown to be effective for mild-to-moderate depression, with fewer side effects than most antidepressants. It helps prolong the action of serotonin in the brain. However, St. John's wort should not be taken in conjunction with other medication. These antidepressants are usually the first treatment option doctors prescribe to depression sufferers, owing to the fewer potential side effects compared to other types. These relieve symptoms by increasing the activity of serotonin in the brain. Side effects can include drowsiness, sexual dysfunction, and headaches. Menopause is a big change in a woman's life, and so it is not surprising that many report developing some degree of depression. However, there are many therapies for menopausal depression, and the first step is recognizing the signs and then working out the best route to take. Depression is a serious condition that cannot be treated simply by adjusting the foods we eat. But, certain diets can improve your overall well being.